Does religion make people prejudiced? Scientific studies have suggested that religious belief (regardless of whether it is true or not) has many social and personal benefits, but may encourage more sexist attitudes and a lesser degree of openness to others. Some recent studies have looked at the association of religion with prejudice. ‘Prejudice’ is defined as “an unfavorable opinion or feeling formed beforehand or without knowledge, thought, or reason”. If prejudice stayed as an opinion or feeling, it would be bad enough, but it becomes a more significant issue if it leads to anti-social behaviour. Christians in the US are more likely to be prejudiced against gays, atheists and Muslims, but are not commonly prejudiced against people of different racial and ethnic backgrounds. It seems that christians may not be prejudiced against “outsiders”, but may be wary of those they perceive as threatening their values. Religious belief can increase or reduce prejudice depending on the nature of the belief. More flexible or personal and self-directed belief may lead to greater tolerance, whereas more rigid or social belief may lead to greater prejudice. The difference here seems to be whether a person really believes the ethical teachings of their religion (which generally promote kindness and compassion towards others), or whether their belief is grounded in their membership of a group (in which case they may be motivated to protecting the group from outsiders). Those who believe in an afterlife may be less prejudiced and more caring of others than those who believe death is the end. One study suggests thinking about God will tend to have a positive impact on prejudice whereas thinking about religion tends to have a negative effect. But another study found that strong belief in God was generally associated with prejudice. Belief is more likely to reduce prejudice, but religious ritual can have several effects. Church attendance, religious symbols and involvement in rituals all tend to increase tribalism (the sense of belonging to a group). This means they increase personal and group wellbeing, but tend to lead to greater prejudice against outsiders. However rituals that require personal commitment, especially ones that are personally costly, tend to lead to greater openness to outsiders. It is probably fair to say that religious belief that is personal tends to have positive impacts, but practices that are tribal tend to have negative impacts. Christians in the US (where most of the studies were undertaken) seem to be affected by both effects, and so can tend to be prejudicial towards some groups of people who are seen as threats, whether to them physically or to their beliefs, while being generous and compassionate to those who are seen to need it. 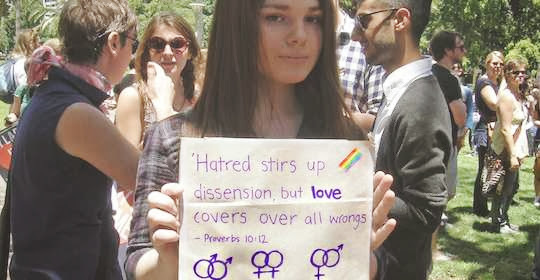 Jesus told his followers to love their enemies, and being prejudiced doesn’t seem to be loving. So christians have a few lessons to learn about changing their behaviour. Some atheists are highly critical of all aspects of religion, but these studies show that it is only some aspects that are detrimental. So atheists should perhaps temper their criticisms to the facts.